ContraxAware explained in 90 Seconds. 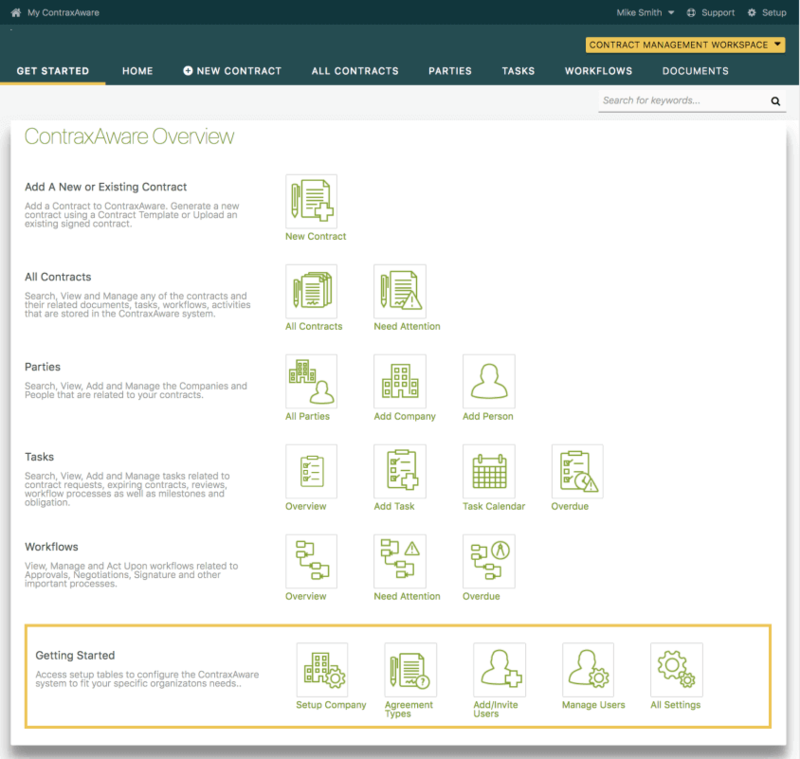 ContraxAware is a complete end-to-end Contract Management Solution to streamline your entire contract management process. So simple, so powerful and so cost effective, you will wonder why you did it any other way. ContraxAware is a centralized and highly secure cloud-based Contract Management Software. Store unlimited contracts documents and related data. 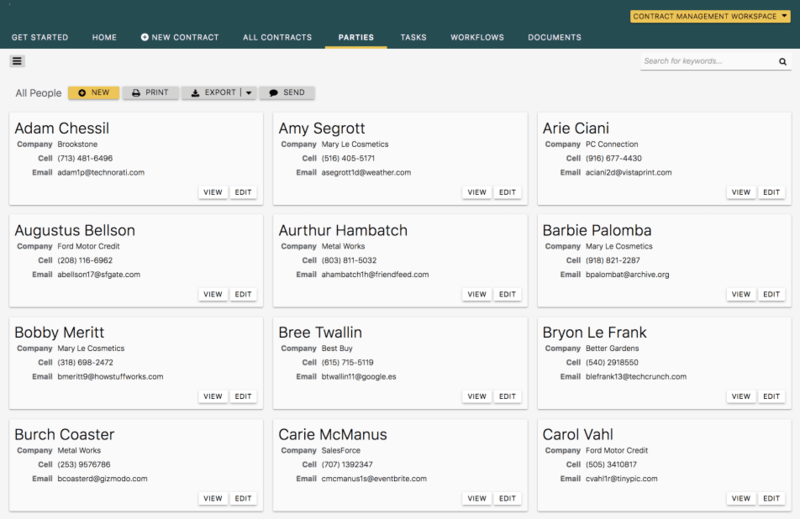 ContraxAwares powerful search features will help you locate any contract in seconds. Secure servers, automated backups, updated OS as well as security control software is all maintained by ContraxAware. Never lose any contract and never lose any sleep because you know we have you covered. All of this included in our simple per user/monthly pricing. Increase visibility by centralizing all of your contracts in a single, secure database that can be accessed from anywhere, on any device, at any time. Find any contract in seconds. Permission-based user access allows you to control what contracts a user can access and the level of access they will be provided. Enforce contract standardization and compliance by uploading all of your standard contract templates into the ContraxAware, Contract Templates Library. 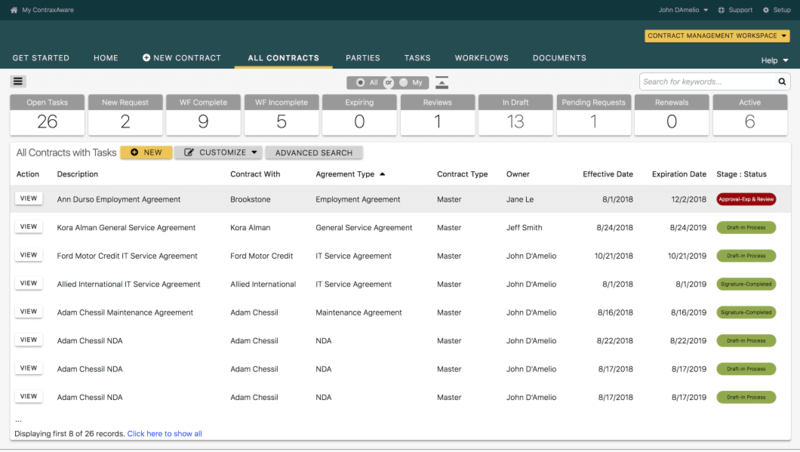 Centralize, manage and approve the standard contract templates your organization will use when generating a new contract. 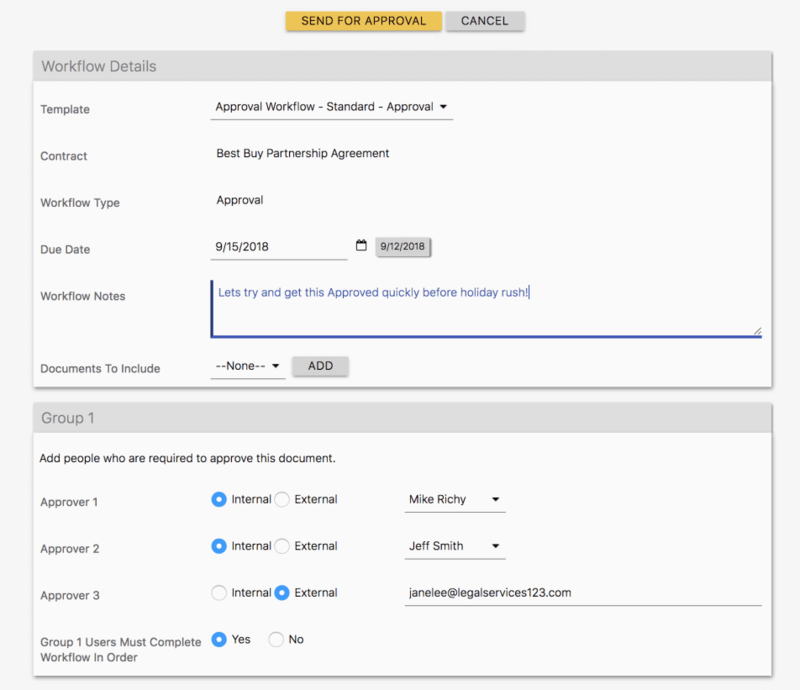 When generating new contracts, ContraxAware will merge the metadata into the selected contract template, and generate a new contract in seconds. Automate your contract approval, renewal, and signature processes by using our easy to use workflow functionality. Configure parallel or serial order workflows and include internal as well as external users to create a complete end to end process. Enhance your signature workflow with our integrated DocuSign Electronic Signatures feature. Never miss an upcoming expiring contract, contract renewal or important milestone date or obligation. Be alerted to incoming contract requests as well as delays and completed workflow processes. Receive automated email notices and scheduled reports straight to your inbox. Display lists, charts and reports to summarize, analyze and categorize any contract data. A 360-degree view of your contracts will provide an overview of information needed to quickly process new contracts and efficiently manage existing contracts. Improved contract management will reduce legal and financial risk and increase profitability. Run one of the many available standard reports or create your own custom reports. 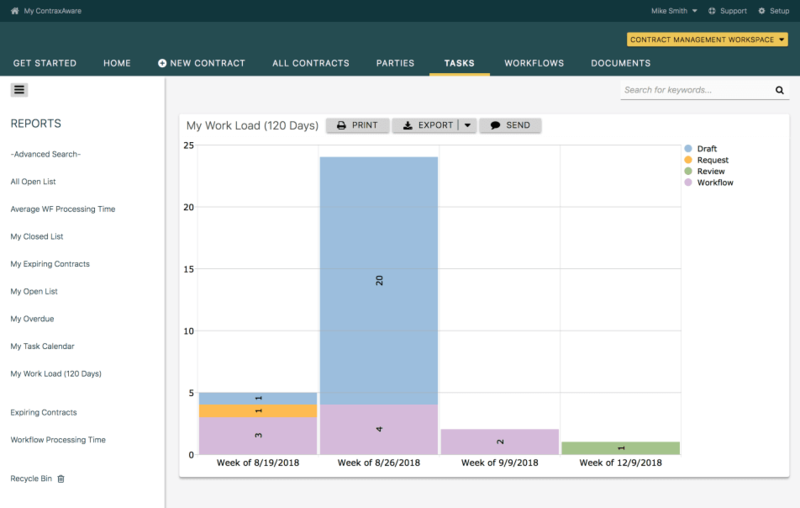 Built-in reporting features such as Filtering, Grouping, and Sorting will further enhance how you can analyze your contract data. Use the Global Text Search feature to locate specific text within all or a set of contract documents. 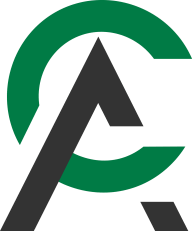 The ContraxAware REST API, gives you the functionality to integrate and share data between the ContraxAware Contract Lifecycle Management ( CLM ) system and other systems within your enterprise. 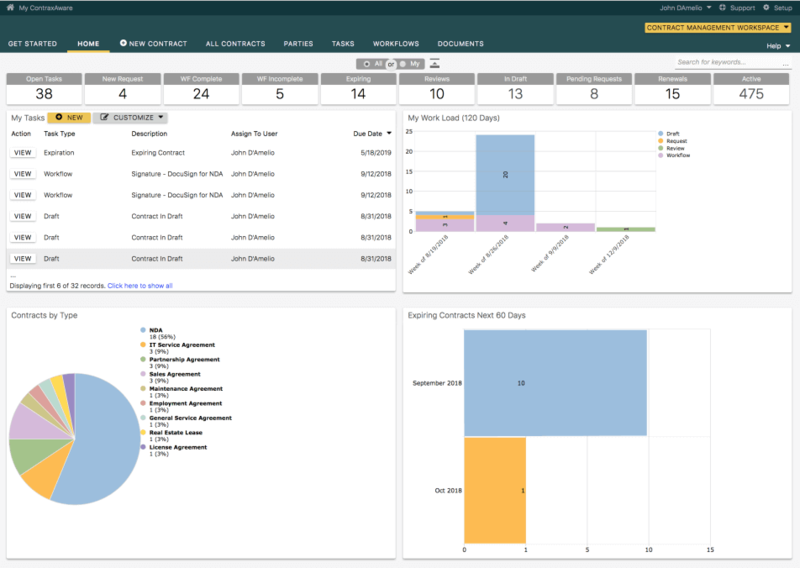 Talk to our team today about integration ContraxAware with your CRM, accounting, purchasing and other systems. Find out more about ContraxAware. Expand your product knowledge of the ContraxAware Contract Management Software. Let the ContraxAware Data Migration Team move any existing contract data or documents you may have. Receive prompt ongoing Customer Support by using our multi-channel support system. Simple yet Advanced - Managing contracts requires attention and constant maintenance. ContraxAware has powerful features organized in a simple, intuitive format that will make this easier. You will find helpful hints and step by step guidance as you move through every process. Each step flows naturally into the other. Even the novice app user will be up to speed quickly using ContraxAware. Configuring a Contract Managemenent Workflow Proccess, such as approval or signature workflows is a breeze. Efficient and Effective - Managing contracts takes time, but with ContraxAware, you will save a lot of time. When you employ our Contract Management Solution, you are using a technically advanced platform to edit, manage, and access your contracts. 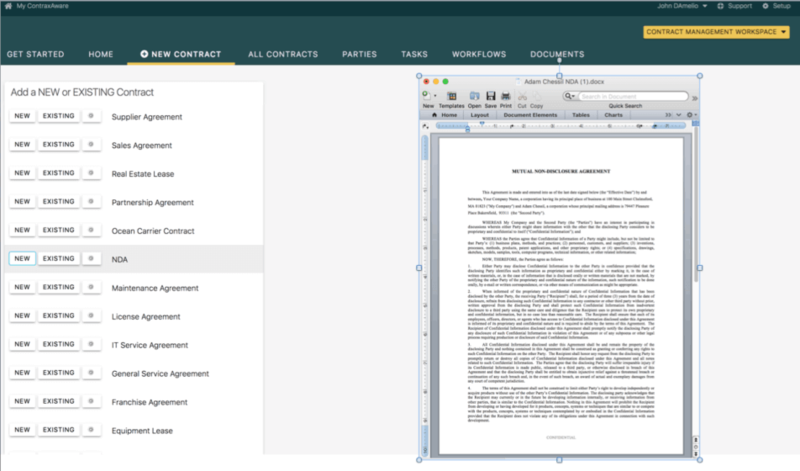 With a few clicks, you can create a new contract or upload an existing document. All user activities related to drafting, reviewing, approving, and signing a contract is documented in a clear audit trail. Each process takes place online, providing a central repository for every team member to collaborate on the task at hand. Work gets done faster and more efficiently, saving time and resources. Here to Help - If you ever have questions while using the ContraxAware software, we are here, ready to help. Our technical team is a highly trained and customer focused group of professionals available to assist with any of your questions. We understand how vital contract management is to your success. Our mission is to support your team in achieving success by utilizing the powerful features of the best Contract Management System available, ContraxAware. Take your Contract Management to a New Level! 14 Day Free Trial Sign up! Thank You for your request for a trial. A member of our team will contact you to get you started.